A consensus group comprising 10 neurologists and four pulmonologists have developed a set of criteria to help physicians sort out suspected cases of neurosarcoidosis, a chronic condition with heterogenous symptoms that is challenging to diagnosis. The group established three categories of diagnosis of neurosarcoidosis: possible, probable, and definite. Neurosarcoidosis, a chronic condition of unknown etiology that most commonly involves the lungs, lymph nodes, eyes, and skin but can also involve the central and peripheral nervous systems, can be a difficult condition to diagnose. Clinical symptoms are very heterogeneous and can resemble any number of neurologic conditions. Diagnosing the condition invariably entails ruling out other possible diagnoses using a number of tests, including a physical and neurologic exam, MRI, or other imaging and cerebrospinal fluid testing to look for evidence of infection or malignancy. Now, in a paper in the December issue of JAMA Neurology, 10 neurologists and four pulmonologists comprising the Neurosarcoidosis Consensus Group have developed a set of criteria to help physicians sort out suspected cases. The group established three categories of diagnosis of neurosarcoidosis: possible, probable, and definite. The consensus group noted that the presence of granulomas is critical in establishing a diagnosis of sarcoidosis, but things aren't always clear-cut, because granulomas can also be present in other disorders such as infectious and inflammatory diseases, various immunodeficiency states, and malignant neoplasms. The consensus group reviewed the medical literature from January 1, 2007 to October 1, 2017, and used the best available evidence and clinical experience to develop a set of diagnostic criteria. The paper did not focus on treatment. “The goal is to increase diagnostic certainty,” said Dr. Stern, who noted that the new criteria should be helpful for both doctors in the community setting and clinicians at referral centers. “Furthermore, for the subset (approximately 10 percent to 19 percent) of patients with presumptive NS and no evidence of systemic extra neural inflammation, the diagnosis can be confirmed only with nervous system biopsy,” which may not be easy depending on the accessibility of the affected site, the consensus group wrote. If immunosuppressant therapy is started for presumptive neurosarcoidosis, it may make the diagnosis of systemic disease difficult, the paper said, though corticosteroids may be essential for keeping the patient from deteriorating. Dr. Ramachandran said he sees about four cases of neurosarcoidosis a year. The last case involved a patient who presented with double vision and headache. Dr. Ramachandran described the multiple steps he would typically take to arrive at a diagnosis. He shared these notes based on a single case: The patient had cranial nerve palsies with impaired extraocular movements associated with double vision and squint. Spinal tap revealed aseptic meningitis. Serum and CSF ACE titres were elevated. She had pulmonary sarcoidosis as well. Dr. Ramachandran said the diagnosis was made by a history, physical, past history and work-up including a biopsy showing a noncaseating lesion of sarcoid, classic hilar adenopathy, elevated ACE titre, and brain MRI with meningeal enhancement. Mohammad Abdoli, MD, a clinical fellow in multiple sclerosis (MS) and a resident in neurology at University of Ottawa, published a paper in 2015 in Multiple Sclerosis and Related Disorders in which he and a colleague described the challenges of diagnosing neurosarcoidosis, in part because of its many modes of presentations. Symptoms may resemble MS, for instance, or lymphoma, or infectious diseases such as Lyme disease. Dr. Abdoli recently had a case that presented with symptoms characteristics of a brain tumor, but a biopsy found the patient had neurosarcoidosis. Without a confirmatory biopsy showing evidence of sarcoidosis in the nervous system, patients are often left with a diagnosis of “possible neurosarcoidosis,” Dr. Abdoli said. His published paper also contained suggested diagnostic criteria, which were fairly similar to the new ones outlined in JAMA Neurology. Dr. Abdoli said getting a correct diagnosis is important so that treatment can be optimized as quickly as possible. Neurosarcoidosis that involves the central nervous system, can, without proper treatment, result in disability or even death in about 5 to 10 percent of patients, he said. Although there may be few new ideas in this new paper, its criteria should be useful for clinicians as a guideline to make the diagnosis with more confidence and treat patients with the proper medication, Dr. Abdoli continued. Having a consensus criteria may also be useful in terms of finding uniform groups of patient with NS for research studies. Dr. Stern has received royalty payments from UptoDate, Inc., for an article on neuroscarcoidosis and received payments for serving as an expert witness in legal procedings related to narcosarcoidosis. As an associate editor of Neurology Today, he has received support from the AAN. The clinical presentation and diagnostic evaluation suggest neurosarcoidosis, as defined by the clinical manifestations and MRI, CSF, and/or/EMG/NCS findings typical of granulomatous inflammation of the nervous system and after rigorous exclusion of other causes. There is no pathological conformation of granulomatous disease. The clinical presentation and diagnostic evaluation suggest neurosarcoidosis, as defined by the clinical manifestations and MRI, CSF, and/or EMG/NCS findings typical of granulomatous inflammation of the nervous system after rigorous exclusion of other causes. There is pathologic conformation of systemic granulomatous disease consistent with sarcoidosis. The nervous system pathology is consistent with neurosarcoidosis. Type a: Extraneural sarcoidosis is evident. Type b: No extramural sarcoidosis is evident (isolated CNS sarcoidosis). •. Stern BJ, Royal W III, Gelfand JM, et al. Definition and consensus diagnostic criteria for neurosarcoidosis: From the Neurosarcoidosis Consortium Consensus Group https://jamanetwork.com/journals/jamaneurology/fullarticle/2696970. JAMA Neurol 2018:75(12):1546–1553. 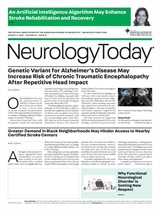 Neurology Today19(3):39-41, February 7, 2019.